This report shows the disparity in robustness of England’s local labour markets. Looking at the vulnerabilities of local labour markets to the impact of changes to migration policy after Brexit, the automation of manual jobs, and the challenges of deficient skills bases and demographics, we see a country which is moving beyond the ‘north-south divide’ as a means to frame the discussion on our country’s inequity in wealth and outcomes, and towards something which resembles a vortex. Money, both public and private, infrastructure, R&D and foreign investment, is all flowing into London and the space which occupies the golden triangle between it, Oxford and Cambridge. There are of course some geographic outliers performing well, Brighton and Hove for example, but the days in which someone living in Kent or Essex might see connectivity to London as a passport to prosperity are numbered. Our research suggests the labour markets of the South East need support as much as certain parts of the North East. In the absence of a clear national labour market strategy which factors in the emergent threats laid out in the report, strategic authorities must take the lead on devising local labour market strategies. These should inform local employment and skills provision and be a valuable resource for central government when it comes to understanding the impact of exiting the EU and any subsequent trading agreement. Beyond the technical analysis and policy recommendations of this report sits a singular message to our national political elite: when it comes to the labour market, place matters. The variability in robustness of England’s local labour markets is staggering. 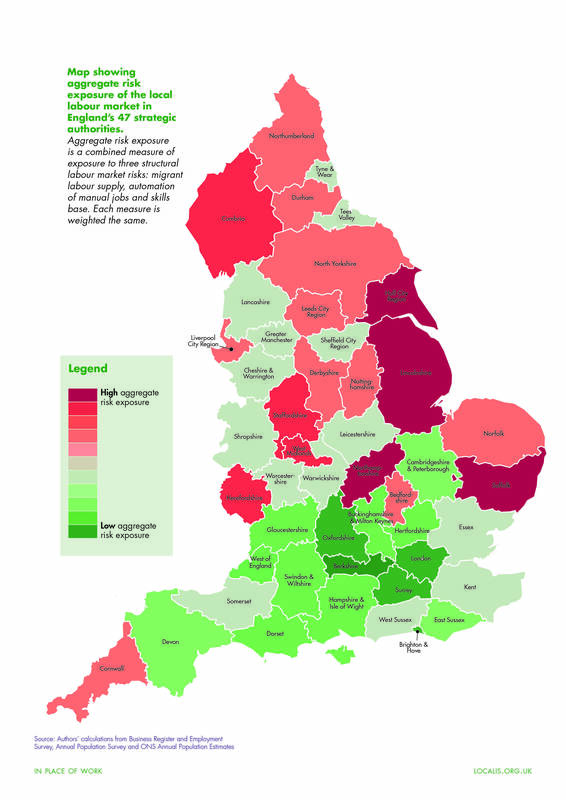 The map below shows the aggregate risk exposure of the local labour market in England’s 47 strategic authorities. Aggregate risk exposure is a combined measure of exposure to three structural labour market risks: migrant labour supply, automation of manual jobs and skills base. Each measure is weighted the same. Recommendation one: Government should formally recognise the status of England’s remaining strategic authorities without a devolution deal by instituting an Industrial Compact, as recommended in the previous Localis report The Making of an Industrial Strategy, thus creating the devolved bases upon which new local labour market strategies and powers can be developed and utilised. Recommendation two: As part of every new local industrial strategy, every local area should develop a local labour market influencing strategy which highlights at-risk industries and businesses. Recommendation three: As in Greater Manchester, and in London by 2019/2020, government should devolve control of the adult education budget to all remaining strategic authority areas. This would empower them to convene local colleges, training providers and businesses in order to set the priorities for their local labour market strategies. Recommendation four: Local public sector organisations, most pressingly it would be sensible for the NHS and local government to collaborate, should explore what options are available to pool their apprenticeship levy within a strategic authority area. In particular this should be seen as a priority in areas where the health and social care workforce is dependent on a significant amount of migrant labour. Recommendation five: Government should accelerate the April 2018 deadline for moving funds held in an apprenticeship levy account to another firm, and remove the 10% threshold. Recommendation six: Government should create the option to allow employers to passport their apprenticeship levy funds to a strategic authority for local skills development activity. This would need to be ring-fenced and the priorities for development established before a strategic authority could accept the funds. Recommendation seven: Government should empower and fund strategic authorities to raise the profile of apprenticeships and the wider state support offered for in work training. The most successful and advanced strategic authorities should be legally allowed to set ‘start quotas’ for apprenticeships in their areas. Recommendation eight: In local areas where industry collaboration is weak and relationships with the strategic authority need formalising, strategic authorities should establish employer guilds. These guilds would work with the strategic authority to help shape labour market policy, thus ensuring a steady supply of qualified labour for their future business requirements. Recommendation nine: As in the previous Localis report A Sector Deal for Disability we reiterate the recommendation for the Department for Work and Pensions to establish and chair a new working group on skills, access and employability for people with disabilities to support the sharing of best practice amongst councils, CCGs, schools and colleges locally. Preferably this should utilise existing professional networks. Recommendation ten: Government should take a top slice of 5% from apprenticeship levy accounts nationally in order to create a Local Skills Development Fund which can be devolved and focused on supporting strategic authorities efforts to raise the employment level of key low activity groups, in particular disabled people and the over 50s. For more information on the report in general, its findings or its recommendations, please get in touch with joe.fyans@localis.org.uk.